Solo relaxing under the Deodar (click for larger view). More photos in slideshow, below. Some readers will remember meeting Solo a few months ago, and perhaps appreciate an update. He’s two years old now, still immensely curious and still visiting us daily. But one thing is different: our little boy is looking quite grown up. Over the years we’ve watched a number of male black-tailed deer at close range. At two years old, each has been different in the headgear department. Some early antlers, like those worn by Pretty Boy, have been symmetrical beauties; others have been short and stubby; a few have been only long, thin points. One of my favorite young bucks, Holey Coat, had just a single antler (I called him our “unicorn”). I’d noticed the variety, but I’d never really paid attention to how fast those antlers can develop once they start growing. I’ve tried to document this growth in the short slideshow below (6 images with dates). As you’ll see in the earliest photo (December 2012), up until last winter Solo showed only the slightest hint he would ever have antlers: tiny round marks on his forehead. By April, those nubs had swollen into respectable little bumps. Then the pace suddenly picked up. His first set of antlers started to emerge: wide, thick and ever so promising. All being well, they’ll keep growing through the summer and into the fall, then late next winter he’ll lose them – to start all over again next spring. I’ve read that deer antlers grow by half an inch a day at this time of year. Check out Solo’s progress in these six images (start from December – for manual controls, mouse over the lower part of the image). Don’t you agree, he’s growing up quickly? 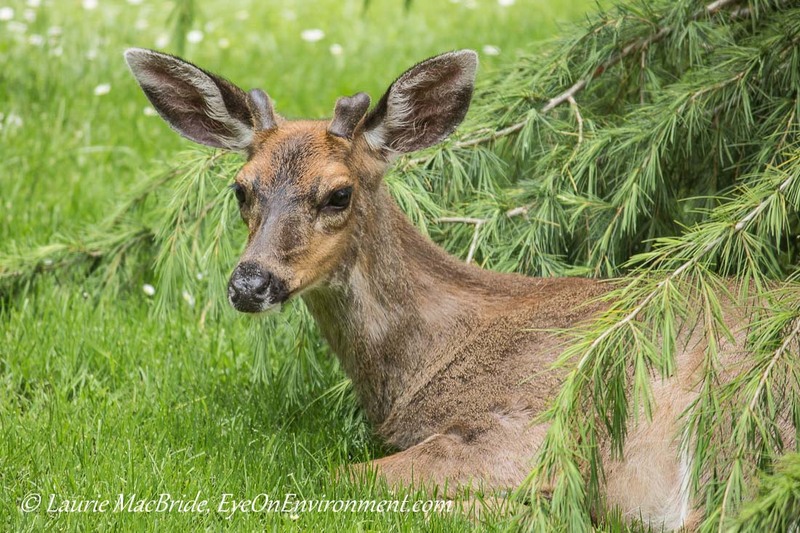 Posted by Laurie MacBride, Eye on Environment on June 3, 2013 in Animals & Wildlife, Mammals and tagged antlers, deer, growing up, nature, photos, spring. I love this post on so many levels, Laurie! What a beautiful young fellow there, he’s growing up to be quite the regal member of his society! I think this is a great shot and a fabulous presentation you’ve done here, it’s fascinating and fun at the same time! Thank you, Martin! It helps that Solo is a good subject – he doesn’t mind having me point my lens at him over and over again! Awww…so great they are growing up and getting their antlers! Thanks for the visit and the comment! Glad you like the images. Hi Laurie – this is a great set of images. it had never occurred to me that they were growing this fast, but now that you have shown it, it sure makes sense. These are great shots too, I like having deer around – the sleep in our yard at this time of the year.I know gardeners hate them, but they are a reminder of wilderness that is welcome in the city. Thanks so much, ehpem! I’m surprised – and delighted to hear – that you get them in your yard there in the city. I’m a gardener, but I love them – of course we have to make sure the fence around the garden plot is sturdy and tall enough. I just love how you’ve done this, Laurie. It’s just fascinating to see how antlers grow close up. Your sensitive and beautiful images make me feel I am right there with you and Solo. Thank you. You’re most welcome, and thank you for the lovely comment! Wish my hair and nails grew like these antlers — well, maybe not…. What a concept! I think I’m with you on the “maybe not” – especially since the antlers will fall off every year. Thanks for the visit & comment Patti.